The Boy and I went out for our walk yesterday. We decided we needed to gather all the pretty nature things we found along our way: sticks, rocks, grass heads, and the like. We made quite a lovely (and extensive) collection actually. 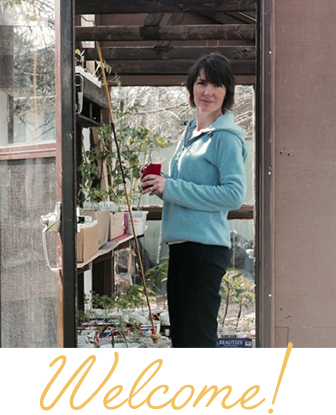 When we came home again, we had no idea what we were going to do with it all. 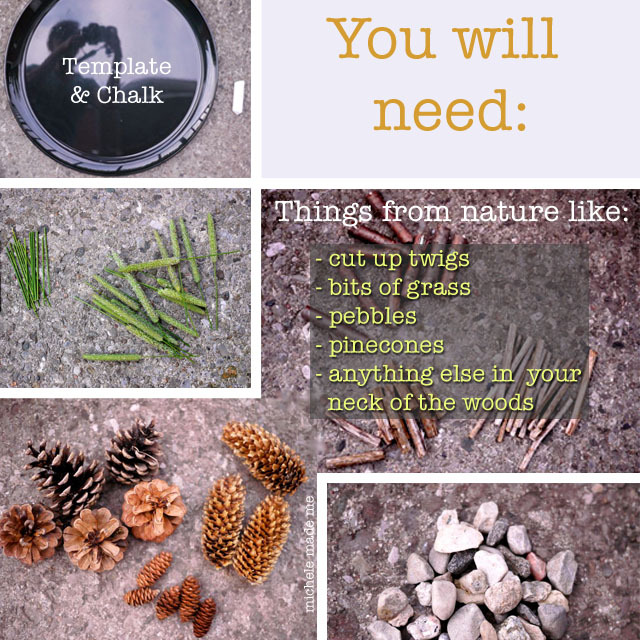 Once you’ve gathered together all the natural elements, you will now need to draw a shape in the sidewalk with chalk. We drew an 18″ (45 cm) circle using a large platter as our template but you could also draw a square, a triangle, a soft-bellied amoeba, whatever! The game can be played by one, two, or many. If many are playing, make the shape bigger. If you’re playing by yourself then you may decide to make it smaller. 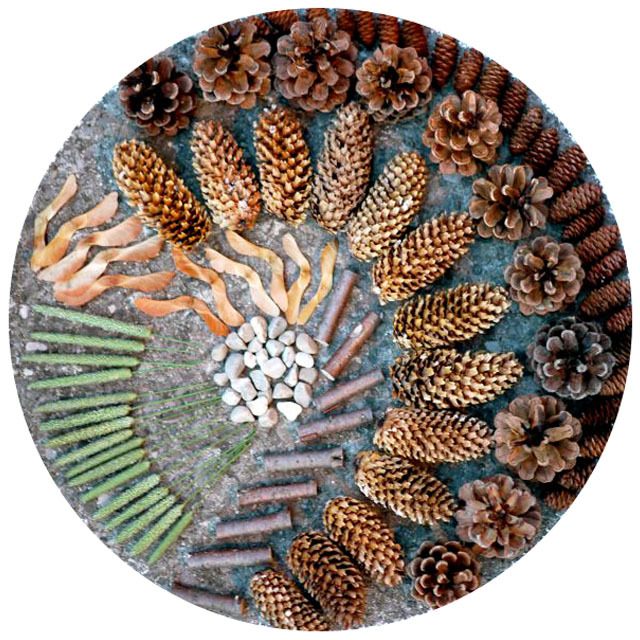 Arrange all your nature things in piles around the shape. Decide who goes first. Step 1: Player 1 chooses one type of object, say sticks, and arranges the sticks however she likes within the shape. Note: No player is allowed to interfere with another player’s turn, or criticize another player’s design choices. Step 2: Player 2 chooses one type of object, say grassheads, and arranges them however he likes within the shape. Step 3: Player 3 (and so on and so forth) continues in this way, adding one type of element to the design, until the design is complete to everyone’s satisfaction. Stand back and admire the team effort! Step 4: Photograph the finished design. Step 5: Play again if you like. Step 6: Repeat steps 1 to 5. Make a collage of all the finished design photos and add it to your photo album. The great thing about this game is that it can be played anywhere, with any objects and with anyone. AND everyone wins! Play it at home with Mom, camping with Grandpa and Grandma, on a picnic with friends, at the beach with your sisters, indoors or out. The Boy lasted well over an hour (not including the initial hunt) and in that time we made at least 10 designs. All in all our game was a rousing success! Naturally pretty, wouldn’t you say? 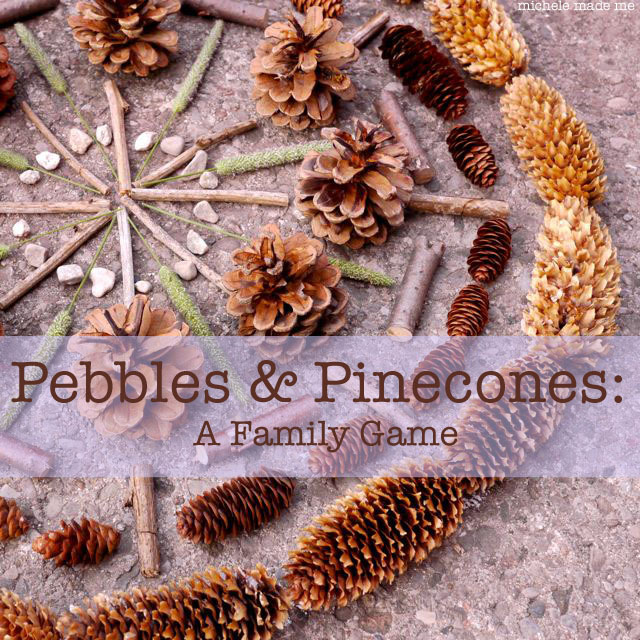 Have fun playing “Pebbles & Pinecones” yourself! So awesome. I have to find a kid to play this with me. Even "big kids" will enjoy this one. I know I did! My Gosh!! This is amazing! I mean truly breathtaking!!!!! LOVE all the designs and I know I'll be playing this with my kids at the beach!! I just pinned this and had to return again and admire all of them!! Michele – I knew you were genius! I just had to say that again! A delightful idea and I bet it was relaxing..
What a wonderful find for the passers-by. I love to collect those items. I put them in baskets as home dec.
seems like a perfect way to celebrate every season. Oh my gosh this is SO AWESOME!!! I am totally excited by this. Thank you very much for sharing it. The photos are beautiful! You are so brilliant. What a perfect game for a summer of camping fun!!! 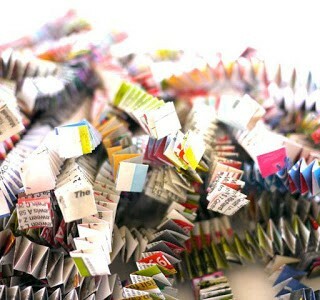 Art from sticks and stones! These are all amazing and the photos are just a little bit stunning. Wonderful post! So beautiful. I visit your site often just for the relaxation, and creativity ! You are a gem. Beautiful & seems so much fun 🙂 thanks for sharing dear..
Gorgeous graffiti! What a thrill to come across something like that..
Wow! What a fun idea. I love how creative you two are! 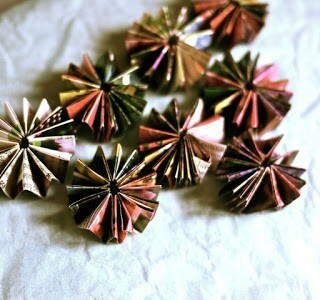 They are such beautiful designs too. What a great summery activity to do! 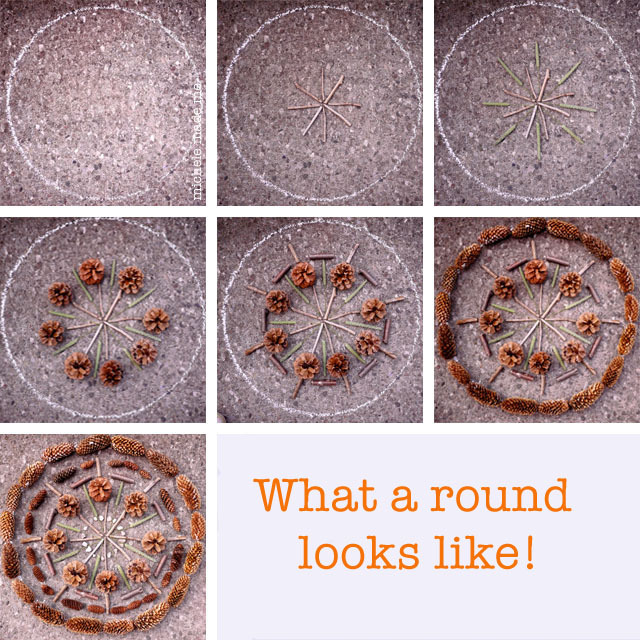 They're mandalas. Uwielbiam mandale. Piękny pomysł do propagowania. Czysta areterapia. That’s double fun, first the hunt and then all those fabulous designs! 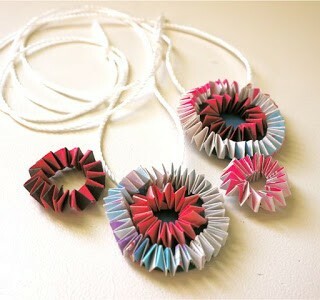 These are beautiful, and what an excellent idea! Just the types of things i collect & love! Thank you for sharing! Oh this is a fabulous idea! My grandson is coming next week for a month and we will be visiting many of my "secret places" He tends to fill his pockets just like i do and now we will have a great time playing your game at the day's end. Thank you 1,000 times for sharing! Wow. What a totally fab idea. And so simple! Thanks for this great game!! 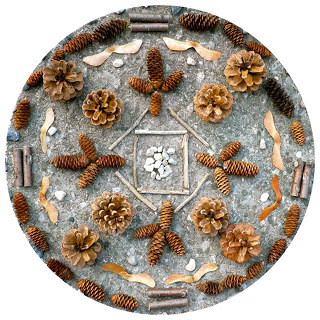 such a gorgeous way to celebrate nature – your works are mandalas and very beautiful. 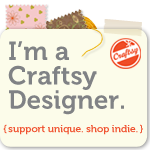 such a sweet thing to discover your blog via crafty crow! divine! This beautiful. What a profound yet simple way for children to connect to nature, patterns and love for the earth. Thank you for sharing this brilliant idea….this is very generous of you. Reminds me of the work of Andy Goldsworthy. 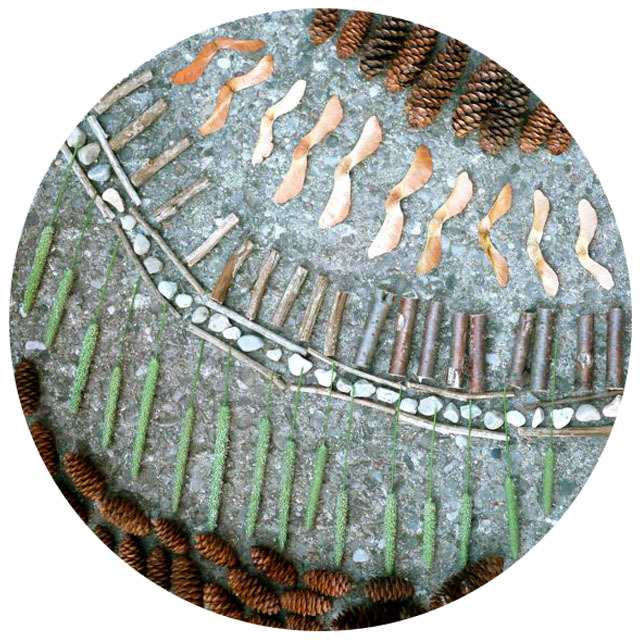 Beautiful land art! 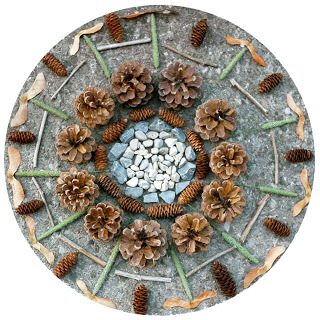 Have you tried this with flowers on the spring or overlaying some fresh snow? !